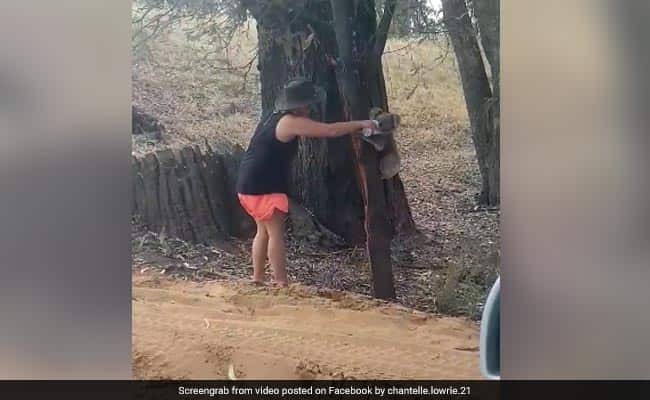 The woman posted on Facebook footage of herself giving water to the furry marsupial, who drank from the bottle before climbing back up the tree. The woman was at a camping ground near the Murray River in Victoria when she saw the koala. As Australia swelters in an extreme heatwave, a video of a woman in the state of Victoria pouring water into the mouth of a thirsty koala has melted hearts online. The vast continent has experienced intense heat over the past week, with the mercury up 16 degrees Celsius (60 degrees Fahrenheit) higher than usual for this time of year in southern Australia. Numerous towns set new December records, according to the Bureau of Meteorology, while emergency services have been on high alert for bushfires. Local Chantelle Lowrie was at a camping ground near the Murray River in the southern state of Victoria on Friday when she saw the koala. "It was 44 degrees Celsius -- very, very hot day," Lowrie told AFP on Tuesday. "I stopped because he looked as though he could use a drink of water." Lowrie posted on Facebook footage of herself giving water to the furry marsupial, who drank from the bottle before climbing back up the tree. The footage is reminiscent of another video of a koala, later nicknamed Sam, who drank from a bottle offered by a firefighter during deadly bushfires in Victoria in 2009. High temperatures are not unusual in the Australian summer, with bushfires a common occurrence. But climate change has pushed up land and sea temperatures, leading to more extremely hot days and severe fire seasons.